Whether she was running around a beach in West Cork with her young family, or at home entertaining her friends and their children, Veronica Kenneally dreamt of a time when snack-time didn't have to be junk-food time. She knew there had to be a better way. And so her Good Crisp Crusade began! Two years later, the Veronica's Snacks brand of better-for-you-but-oh-so-tasty Baked Potato Crisps and Baked Veggie Crisps are available in stores and supermarkets across Ireland and the UK. 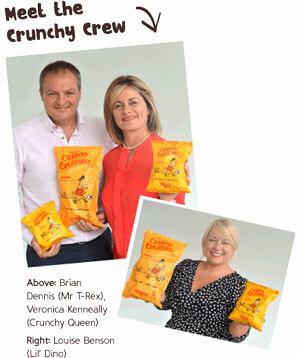 Veronica then turned her attention to creating a range of healthy and fun snacks for the younger market. With three children of her own, she knew a thing or two about appealing to young taste-buds and imaginations! How about munchy, crunchy, baked corn snacks in the shape of DINOSAURS? She got the thumbs-up from the home-jury and so Crunchy Creatures were created! They're baked not fried, gluten-free and low in fat. They're the ultimate guilt-free snack for your kids (and yourself). As Veronica says, "now you've all got permission to munch!"